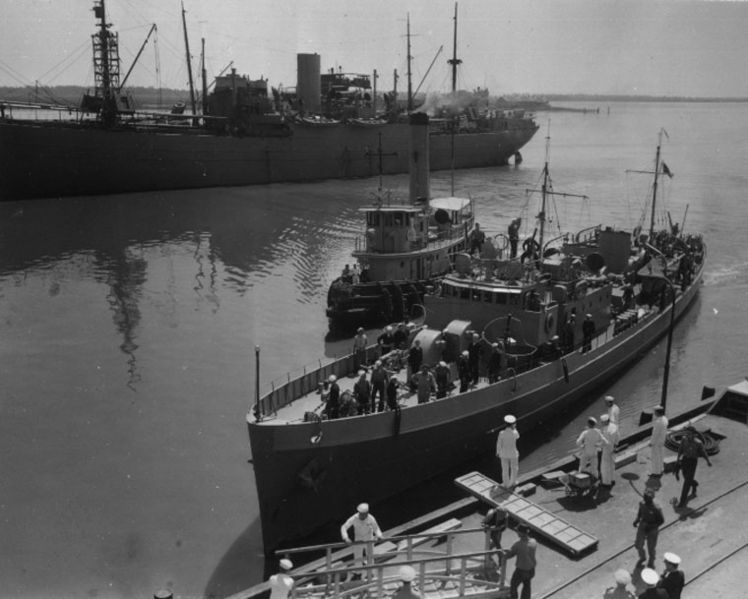 Icarus arrives at Charleston Navy Yard on May 10, 1942 to deliver prisoners from U-352. One of the earliest submarines to reach the Coast under Operation Drumroll was U-352. The sub had made an earlier trip off Iceland but failed to sink any ships. U-352 left Europe for its second war sortie on April 4th and arrived off the American coast on May 2nd after a four week crossing. The sub's commander, Kapitänleutnant Hellmut Rathke, was determined to do better his second time out. Three days after taking station off the American coast, he attacked a refrigerator ship with no success. Rathke attacked three more freighters but all escaped without harm. On May seventh, U-352 was nearly caught on the surface by an airplane and a crash dive barely saved it from the plane's bombs. The plane radioed the sub's position and now the hunter had become the hunted. When U-352 arrived off the East Coast the largest anti-submarine combatant in the immediate area to oppose it was the diminutive 165 foot cutter Dione. The cutter's patrol area extended from Norfolk, Virginia, to Morehead City, North Carolina, one of the busiest areas for shipping off the East Coast and also an active submarine hunting ground. It was here that the U-boats performed their most damaging work. For several months the daily routine of the patrol vessels off North Carolina was filled not only with hunting submarines but also with the rescue of hundreds of men from torpedoed ships. There were so many torpedoings that these small cutters spent much of their time shuttling between reported attacks and sinkings. The German submarines began moving their attacks further south, therefore the Navy shifted anti-submarine vessels in this direction. The 165 foot Icarus, a sister of the Dione, received orders to proceed to Key West, Florida. Here the cutter would work the southern end of the "Bucket Brigade Convoys." Icarus had spent the first months of the war making patrols out of the New York area and left for Florida early on May 8th. The small cutter began the routine trip south, passing a couple of convoys, and arrived off the Coast of North Carolina a day later. Armed with obsolete sound detection gear, a World War I era Y-gun, stern depth charge racks, a 3-inch deck gun and a combination of six .50 caliber and Lewis machine guns, Icarus was much less of a threat to a U-boat than a destroyer. About the time that Rathke spotted the mast of Icarus, Jester retired to his quarters. With the U-352 nearby, the soundman on board the cutter picked up a "mushy" sound contact. The sound came from off the port bow at a range of about 1900 yards. Jester was called on the bridge. The sharpness of the contact improved and its location began to draw abaft of the beam. Suddenly, an explosion rocked the little cutter and Jester ordered the crew to battle stations and turned the Icarus hard aport toward the suspect sound. Everyone on the bridge realized that they had just been missed by a torpedo that struck the ocean bottom. Icarus steamed toward the contact and for the first time picked up propeller noises on the listening gear. With U-352 on the bottom, Jester temporarily lost contact. Calculating the sub's location he made a pass and dropped five depth charges in the shape of a diamond with one charge in the middle. Icarus dropped one charge from a rack, followed by two from the Y-gun, releasing another single charge from the rack and finishing the pattern with another rack charge. Jester then reversed course and detected the submarine moving west. Moving to intercept, three more depth charges were dropped in a V pattern at a point on the U-boats apparent track. Large bubbles began to break the surface and the Icarus doubled back to drop a single charge on this spot. Not satisfied with the results Jester had one more charge dropped to the right side of the previous spot. The U-352 took a pounding! During the cutter's first run, two of the depth charges fell near the conning tower, one near the deck gun, one over the engine room and the last fell astern. All the gauges in the control room shattered, the lights went out, the attack periscope was damaged, the motors had been knocked off their mounts, the deck gun was gone and the conning tower officer was dead. Rathke knew he could not attack now. His remaining hope was to remain motionless on the bottom and hope the cutter would not be able to detect his boat and then leave. Icarus, though, had not finished. The soundman still hearing the sub moving slowly across the bottom prompted Jester to order subsequent attacks. Shortly after the last charge was dropped Rathke decided that the Icarus knew where his sub lay and ordered the ballast tanks blown to bring the sub to the surface. He ordered the men into their life jackets and diving lungs and gave instructions for the vessel to be scuttled. The submarine broke the surface forty-five minutes after the battle began only one thousand yards from the cutter. The gun crews of the Icarus immediately opened fire with all six machine guns to prevent the sub's crew from manning their deck guns. Turning Icarus, Jester put it on a course to ram the sub if necessary. Now the three-inch gun on the cutter's bow bore on U-352 and opened fire. The first round was short but ricocheted through the conning tower. The second round passed over the sub, but the next twelve rounds either hit or came close to their mark. Moments after the sub surfaced, the German crewmen began pouring onto the deck in clock-like precision. The Icarus did not secure its guns and fired on the hapless crew as they abandoned the vessel. After realizing that they did not intend to fight back, Jester ordered his men to cease fire. The sub's crew continued to jump in the water as U-352 sank beneath their feet. The Icarus continued to circle the spot where the sub sank and unleashed one last depth charge over the wreck of the U-352. Sinking an enemy sub fell within the orders issued to Jester, but none were in force for rescuing German survivors. Calling both Norfolk and Charleston, Jester finally received permission to pick the men up thirty minutes after the sinking. Icarus picked up thirty-three prisoners but one died enroute. Among them was Kapitanleutnant Hellmut Rathke. Several of the crew spoke English and talked freely with the American sailors. The prisoners arrived at the Charleston Navy Yard the next day providing the Coast Guard with opportunities to photograph the first U.S. captured German U-boat officers and men. CHINCOTEAGUE, Friday, September 6, 1947 - Military gravesite services were held yesterday at 10 a.m. in Arlington National Cemetery, Fort Myer, Virginia, for Coast Guard Commander Maurice David Jester, 68, who had been living in Chincoteague for the past 13 years. Others are four brothers, all of Chincotheague, Ralph, C. Ray, Elijah A. Jr., and Edwin Jeter, and nine grandchildren.